It is now a rare and intact example of early twentieth century wharf construction and is unique in the Sydney region for its very early use of reinforced concrete. The finger wharf is also unique in that it retains in its fabric and configuration, evidence of its linking of rail, road and sea transportation. Since its completion in 1919, this wharf has played an important role in significant historical events and the development of Australia’s international trade and retains physical evidence of these various uses. The Jones Bay Finger Wharf is of exceptional cultural significance as a remarkable port structure, whose size and classical modular design make it a landmark for Pyrmont and Darling Harbour specifically, and Sydney Harbour generally. Despite the loss of certain features, the Jones Bay Finger Wharf is a substantially complete and intact example of early twentieth century waterfront technology at its most developed. Its early use of reinforced concrete make it a unique wharf structure in the Sydney region. This together with the use of steel lattice columns, riveted steel girders, bow-string steel trusses, and hardwood, all in combination, make it a highly innovative structure for its time. The Jones Bay Finger Wharf survives as a unique waterfront facility in Sydney Harbour, retaining in its fabric and configuration, evidence of its linking of rail, road and sea transportation. The rail connections with the state rail network were integral to the wharf’s design and electric capstans enabled direct wagon shunting on the wharf. Electric lighting and handling facilities such as lifts, cranes and mobile gantries allowed efficient loading to both upper and lower levels. No other wharfage group displays the full range of facilities as is at the Jones Bay Finger Wharf. The Jones Bay Finger Wharf is an integral part of our maritime history and forms a key element of the historic Pyrmont waterfront. It retains significant associations with the development of Australia’s, foreign trade and associated waterfront industries. It has supported a variety of uses over the past 75 years, handling millions of tonnes of goods and providing employment for hundreds of stevedores. The Jones Bay Finger Wharf also retains significant associations with major events in Australia’s history. It was one of the staging points for Australian troops leaving for combat in the Second World War and also the point of entry into Australia for many migrants after the Second World War. Jones Bay Finger Wharf together with its adjacent elements, the Royal Edward Victualling Yard, other early waterfront elements, the cliff face, bridges and Way’s Terrace, forms a cohesive precinct with a strong and distinctive identity as part of a working harbour. It is continuation of this maritime activity, combined with the associated extant structures, which gives the precinct a character and integrity almost unique in Sydney. Jones Bay Wharf Berths 19-21 were constructed during the period 1911-1919. Work was sporadically interrupted by material and labour shortages during World War I. The jetties were constructed between 1911 and 1917 and the wharves between 1914-1919. The constructing authority was the Sydney Harbour Trust, established in 1901, which took over all private wharf facilities and established a ten year plan for the Harbour involving complete re-development of port facilities and the construction of new wharfage. The Wharf was built to accommodate the needs of overseas ships which were becoming much larger requiring efficient handling and quick turnaround. Other berths which were built just prior to and during the construction of Pyrmont Wharf Berths 19-23 were those at Walsh Bay, Millers Point and Woolloomooloo. The Pyrmont Wharves differed significantly in the provision of rail links to Berths 19-22 as an integral part of their design. They linked to Darling Harbour and to the New South Wales extensive railway network, and were designed to carry large volumes of wool and wheat for export. From the 1870s, Pyrmont’s residential building stock increased to service its fast growing maritime, industrial and commercial ventures. The development of Jones Bay Wharf forms a part of this expansion and has a direct association with the working history of this inner city suburb, and relates to the aspirations of the Sydney Harbour Trust to provide for the city’s continued growth and prosperity. During World War II the wharves at Pyrmont were an important centre for the movement of troops and materials. They remained an effective port facility until the end of the Second World War, after which their usefulness for trade and freight lessened, due to changes to Australia’s trading policies and the development of containerisation in the 1960s. In the post war years the Jones Bay Wharf was an important site for immigration, used as an overseas passenger terminal. After the construction of the new overseas passenger terminal at Circular Quay, the wharves were used for limited commercial purposes and storage. In 1991 the Jones Bay Wharf was declared surplus to government requirements, and various studies were undertaken to determine its future use. A scheme for mixed commercial and residential uses was been approved, and negotiations were finalised in 1999 for The Wharf to be redeveloped. Jones Bay Finger Wharf extends into Jones Bay in a north easterly direction from the Pyrmont Peninsular. It comprises a land filled central section upon which the wharf structures are built, surrounded by a concrete deck supported on concrete encased timber piles. Two rows of rail tracks run along the full length of each side deck, with an added central track for mobile gantries. A third set of tracks run along the east side, closer to the sheds. The wharf sheds comprise two rows of two-storeyed construction with steel framing to the lower floor and timber framing to the upper floor. Each shed is large scale, about 300m long and 50m wide, with a brick end wall at the south shore end, a firebrick wall immediately south of the crossover roadway, and a timber clad gabled end to the harbour. The cladding material is used in a regular and rhythmic configuration of timber infill panels on the long elevations and have clerestory lights along the roof ridges. The roof structure comprises large open timber trusses supporting the roofing above. Between the sheds runs a bitumen paved road at the lower level and a concrete and bitumen paved road at the upper level. The upper roadway is supported on steel stanchions and beams along the centre of the lower road, with a series of white tile lined and flared openings between them, allowing light to enter the lower level. Both roadways are lowered to allow loading directly from the truck tray to the shed floor on each level. The upper roadway connects to Point Street over Jones Bay road via a substantial steel arch bridge. 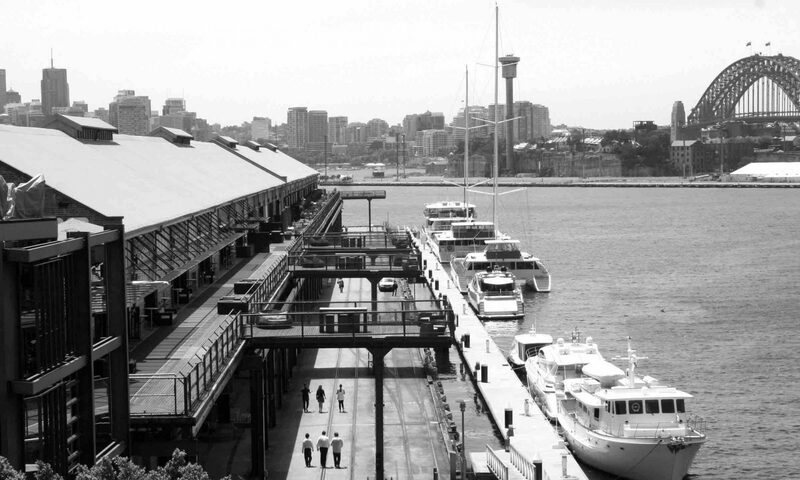 While similar in character to other remaining early 20th century wharves in Sydney Harbour, Berths 19-21 are different in design due to the central upper and lower roadways and the extension of the upper deck over the main wharf level.